The truth is, I’m no genius when it comes to time management. I’m not nearly as organized as I’d like to be! But I do keep working on getting there! One thing that helps me make progress on anything – and especially on my needlework projects – is “chunking off” pieces of time. I mentioned before that needlework is my carrot; I use it as a kind of reward. I tell myself that, if I finish this chore or that project, I get 15 minutes (sometimes more!) with my needle and thread. I also make sure that, on most days, I do get at least 15 minutes to embroider. Of course, there are some days when this doesn’t happen because life is too hectic! But on most days, if I plan right, I can get in at least 15 minutes of stitching or more, even if it’s late at night. Now, you may (and rightly) think that not a lot can be accomplished in 15 minutes. This is true! But 15 minutes here and 15 minutes there do eventually add up to real progress on a project. With today’s article in mind (“15 Minutes with Needle and Thread”), one morning before work, when I had everything ready for the day and still had 25 minutes before I had to leave for work, I set the timer for 15 minutes. Once the timer was set, I took out my embroidery basket. I got my camera and took the above photo of the piece. Then, I began stitching. When the timer went off, I stopped and took another photo. Nope, I didn’t get a LOT done, but I got something done. I finished the pink backstitching on the inside diamond and began the green, which I was pretty close to finishing. Working under the 15-minute time constraint, I had to moderate myself in one regard: when working against the timer, I found I wanted to rush the stitching. But I controlled the urge, and stitched at a normal, comfortable pace, purposely ignoring the fact that the timer was running. When the timer went off, I was sorely tempted to finish the last green edge on the diamond. Since I had to step out the door in ten minutes, though, to head for work, I put the work down. And this had a funny effect on me. I was super eager to get back to the piece – more eager and more enthusiastic about wanting to embroider than I usually am! This, in turn, had a positive effect throughout the day. I had something to look forward to that kept my interest vitalized in everything I was doing. It forced me to get things I needed to get done, done – and in an efficient way. No dawdling on the computer, no lingering over the mail wasting time at lunch, or anything like that. I wanted to get to my next 15 minutes, so I could finish that green line! 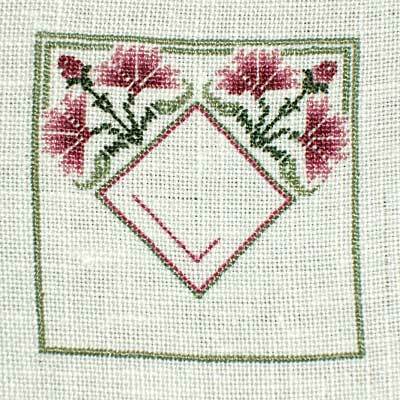 I often hear from other stitchers who say that needlework is a kind of “therapy” for them. I agree that needlework is indeed a balm for troubled spirits in this hectic world. I think that taking 15 minutes a day (or more, if you’re blessed to have more time for it!) to climb out of ourselves and focus on being creative is a good practice. No, you won’t start and finish a project in 15 minutes, but you will make progress towards the finish, and at the same time, you may find you’ve landed 15 minutes of relative peace and happiness! 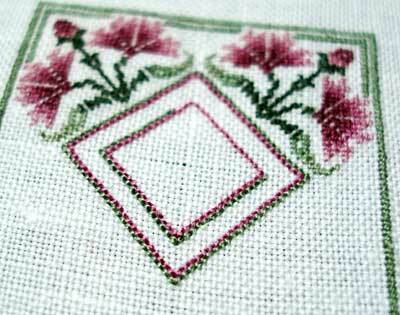 So if you’re frustrated by never having time to stitch, try to establish at least a 15-minute rule. Plan ahead and block out 15 minutes to stitch – whether it’s in the morning before heading to work or in the evening before calling it a day. Maybe it’s in the middle of the day on your lunch break at work, or right after you’ve put the kids down for a nap. Maybe it’s while your dinner’s in the oven. Just 15 minutes! I think you’ll be surprised how much progress you can make on your stitching with just 15 minutes! And now that I’ve been a good girl and written my blog post for the day, guess what? Right! I get 15 minutes with my needle ‘n thread! Bye! Until very recently, I used to “waste time” on the internet while watching television. Apparently I can’t focus on just one thing! I probably spent too much time wandering the web…now that I’ve taken up stitching, I wander a lot less. I also find myself excited to get back to my project, ready to finish my chores so I can get to stitching! I think this is a lovely idea. I will soon be joining office after my maternity leave and time will definitely be a constraint then. So the ‘fixed time interval therapy’ if I may call so would work well for me. Will try out and let you know. You are so right! I agree with everything: the therapy effect that a little slow attentive creative work has, and the 15 minute discipline & reward concept! I too follow your idea. Since I am involved in a very big project at present, I ensure myself everyday that I devote half an hour or more for my embroidery project before going to bed, and I could say I am really surprised with the progress of my project. I am almost done with my project. Although I have a very hectic day at the office on some days, I do not forget to spend time at night to embroider. To me embroidery is like meditation, which increases your concentration power. Thanks a lot Mary for sharing with everyone a wonderful idea. Thanks for your 15 minute advice. I’m struggling at the moment with finding the time to sew. Seems that 3 children and working full time it taking its toll. I’m going to take your advice this week an see how much a get done. Thanks again. I bring my cross stitch to me with work. I try to spend the last 15 minutes of my break time stitching. It’s better than being bored or eating more food than I need to eat. Next Next post: Reader’s Embroidery: Goldwork Peacock Feather!